There can be few instruments on a boat more important than that which indicates the amount of fresh water in the tanks. If there is one thing you need to know on a cruising boat, especially if it doesn’t have a watermaker, it is an accurate indication of how much drinking water you have. Over the six years I have owned BRITANNIA, I have expended endless hours and patience, messing about trying to get the twin water tank gages to register correctly. BRITANNIA has two stainless steel water tanks amidships, one each side. The shape follows the curve of the hull and is therefore somewhat triangular in cross section, tapering to a point at the base. This makes accurate calibration of any type of measuring system difficult, because when the water is half way down the vertical side of the tank, the actual capacity is much less than half full—only about 1/3rd full in my tanks. This physical fact would even apply to the simplest method of measuring water capacity, (and probably the most reliable), where the water level is shown in a transparent sighting tube up the outside of the tank. I considered doing this, but since my tanks are enclosed by bulkheads all round I couldn’t easily drill a hole in the bottom of the tanks to install plumbing fittings and a clear plastic tube. Even if I had managed to fit a sighting tube in each tank, I still would have had to physically mark the tube at various capacity levels. To read it would also mean lifting the floorboards on each side every time. The original system was pneumatic, (air) operated, (note the past tense), which was supposed to read the air pressure differential as the water level in the tanks varied. Basically it is a simple concept, having only two components and no electrics. Just the job for a cruising boat you might think. A rigid plastic pipe mounts vertically inside the tanks, from the top to the bottom, (at least, that’s what I thought), and is connected to a gage by a thin flexible nylon tube. As the water level varies in the tank the pressure changes in the pipe and the tube, and is registered on the gage. The system never worked properly from the day I bought the boat. The gage would frequently drop to zero, sometimes immediately after a tank was filled to the top, or sometimes slowly over a few days. The whole thing was erratic and unreliable. Since there are no electronics involved, I reasoned that there had to be an air leak somewhere, probably in the connections between the tank pipe and the gage, or even in the gage itself. 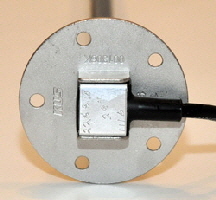 I therefore sealed the connections with epoxy, but still the gages failed. I even took the back off the gages and examined the delicate clock-like mechanism in minute detail. I tightened up the tiny diaphragm mounts and inspected the moving parts—all to no avail. I also conducted numerous water tests, by immersing everything in a bathtub, looking for air bubbles to identify a leak. Finally I even submerged the gage itself, but no air leaks were visible. To make a diagnosis even more difficult, the original manufacturers had long-gone and are nowhere to be found on the internet. The chances of finding any information, help, or spare parts, was therefore slim. To cut a long frustrating story short; I never did find out why the system didn’t work properly. Finally, I decided to look for a reliable alternative, then junk the whole lot. The shape of the tanks meant that a simple electrical swing-arm float sender would not register accurately, because when the arm is half way on it’s ark and the gage registers half full, it will not be correct. There was also a baffle in my tank which obstructed a swing arm system. I then found an electrically operated device, made by Wema/Kus USA. Fort Lauderdale, Florida. www.wemausa.com/sensors/level-FuelWater. This also uses a vertical tube in the tanks, but instead of working on air pressure it has a float which travels up and down the tube, activating electrical signals inside the stainless steel tube, which are read by the gage. The sender tube’s top flange fitting also matched the standard SAE (Society of American Engineers), five hole pattern in the top of my tanks, so I would not have to drill and tap any new mounting holes. 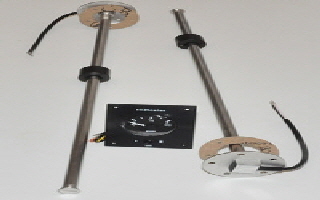 Kus also has a duel gage, mounted on a panel, with a switch to read either port or starboard tank. When it is switched to one side the gage reads from one tank, and when switched to the other it reads from the other tank. In the middle the switch is off and no electric current is being used. 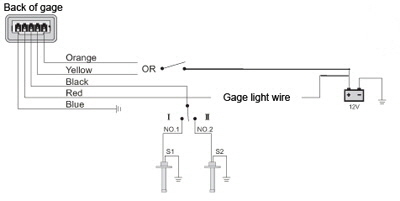 However, for this gage to register accurately for twin tanks, both sides have to be the same shape, which mine are. The gage also lights up when reading a tank. Actually there is a choice between red and yellow illumination. The first test I needed to do was to find out exactly how much water the tanks actually held. I drained both sides by running all the water out through the boats faucets, then re-filled them one at a time using a flow meter fitted to the water hose. I bought this from Amazon.com for $14.96 (part # P3-P0550 ). The actual capacity turned out to be 168 US gallons each side—eight more than the maker’s specification. This gave a total capacity of 336 US gallons, which is 268 Imperial gallons, or 1272 litres. To find out exactly how long the new tank sender pipes needed to be I measured the depth with a length of 1/4” inch diameter wooden dowel. This read 31” inches to the bottom of the tanks. The sender tube would not fit to the bottom of the tank because of the curvature, so I settled for 29” inches. This was when I realized the original 21” inch long tubes could never have registered accurately anyway, even when they presumably worked properly, because they were 8” inches too short, and never reached anywhere near the bottom of the tank. I calculated this produced an error of about 25 gallons on each side. Having determined the capacity, I drained the tanks once more and took the opportunity to flush them with two gallons of swimming pool chlorination liquid from a local pool supply shop. I then ran 42 gallons into the tanks, this being one quarter of the total capacity, then physically measured the water level with my wooden dipstick. Then I added another 42 gallons and measured where half full actually was, then another 42 to bring the capacity to three quarters. I put these dimensions on my drawing, which I e-mailed to the Kus engineer. I drained the tanks once more, then lowered the starboard tank sender tube through the hole in the top of the tank. This was when I discovered that the standard SAE, five hole plate does not have symmetrical holes round the top of the plate, even though it looks like they are equally spaced. There is in fact only one position the plate can be fitted, and to find this you have to rotate the plate and gasket until the holes all line up with the screw holes in the tank. I kept loosing the location of the gasket and plate, until I actually glued the gasket to the top of the tank, then rotated the plate to mate with the existing holes in the top of the tank. After I installed the starboard side another problem arose with the port sender. As I lowered it into the hole in the top of the tank the bottom of the tube rubbed against the tapered side of the tank, and the top plate would not sit flat. I did some measuring and found the hole in the top of this tank had been cut 2” inches further outboard than on the starboard tank, which was why the tube caught against the side of the tank. 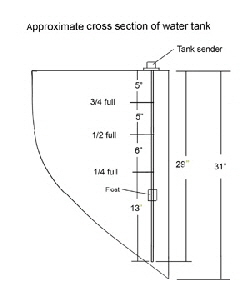 This would prevent the float sinking to the bottom as the tank emptied and give a false reading. There was nothing for it, but to cut a new mounting hole. I first made a cover plate for the old hole from some 1/8” thick stainless steel. I used the gasket as a template and bolted it in place. Drilling the holes in the new location was tricky, because I wanted to ensure the minimum amount of swarf dropped into the water tank. As I drilled I positioned my vacuum near the bit, which sucked up most of the filings. I then used a new 1 1/4” inch diameter hole cuter to make the center hole for the float to pass through. I lowered the sender into the tank, then used the top as a guide to drill a hole through one of the five bolt holes. I tapped this hole with a 5/64th inch thread and screwed the plate tightly in place. This ensured the other four holes would not move and remain accurately positioned. I then drilled and tapped these and secured the unit. The gage was much easier to fit, but needed more than the regular round hole to mount it. It is more like a square hole, which I achieved by making a template out of paper and sticking it in place with Scotch tape, then drilled the corners and cut between them with a keyhole saw. The wiring is easy enough, and I wired the power through a spare contract breaker on the master panel. It was then just a matter of refilling the tanks in one quarter increments, using my flow meter and checking the gage registered correctly, which is did, right through to completely full. Of course, one also has to be aware that the reading from any tank system, including even a simple sighting tube, will be incorrect when the boat is under sail and heeled. I suppose the only remedy for this would be gimbaled tanks…ya’ right! 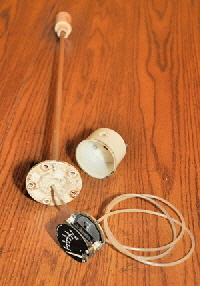 The total cost for two sender tubes and the duel gage panel was $320.00. But if you are content to mark the face of the gage as you fill the tanks, you could just buy a standard system with your appropriate tube lengths, (sold in one inch increments). The price would then be less than my custom calibrated model. Kus also make a similar system for fuel tanks, because the same capacity problem exists when diesel tanks are also to the shape of the hull. At least, when running an engine the consumption can be estimated by knowing the fuel/hours ratio, which is not so for fresh water consumption. It is now a great relief to know I have a reliable record of water capacity for each tank. This enables us to maximize and enjoy the usage, according to whatever length of passage we are making.